They're rare, they're majestic, and they are very adorable when they fall on their faces. Fuku-kun flops down on his face. They're rare, they're majestic, and they are very adorable when they fall on their faces. 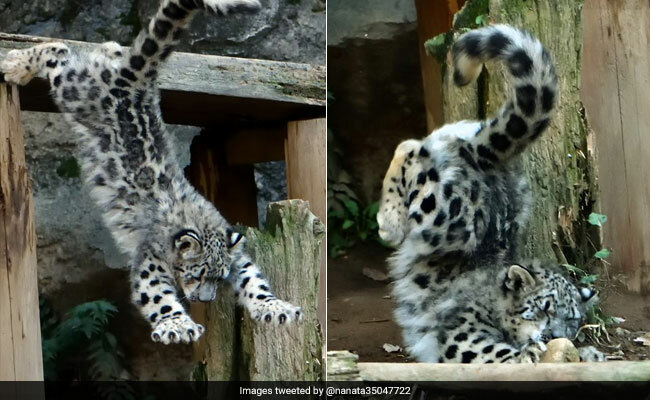 While snow leopards are known to be able to casually jump an impressive distance of 50 feet when they so want, this little cub's first attempt at a jump went a little wrong. At Japan's Tama Zoo Park, little Fuku-kun decided to try his hand (paws?) at a jump, egged on by his mum Mimi. However, the 5-month-old snow leopard fell flat on his face. Hey! He tried his best, okay? A series of four photos, shared by a Twitter user who goes by 'nekooyaji', went viral with over 57,000 'likes' and 30,000 retweets. According to local reports, Fuku-kun was unhurt after his failed attempt and, like any good big cat, went back to try a third and fourth time. We wish Fuku-kun all the best for his future jump attempts.